It just remains to put all unfinished books onto a reading hold over Christmas and become a one-book wonder this week because Bleak House is proving to be positively all-consuming.I’ve opted for the Everyman’s Library edition with the lovely smooth paper, the lush burgundy cover and the ribbon bookmark.You know how easily impressed I am by a ribbon in a book.Then that beautiful little inspirational quote ‘ Everyman, I will go with thee, and be thy guide, in thy most need to go by thy side.’ I have a growing collection of Everyman’s Library, I’m starting to gather my most favourite reads in this very special edition. 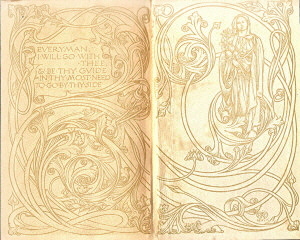 Endpapers from Everyman’s Library, 1912. Is this the end of time? A muffled, fearful, thudding sound, moving, like waves, throughout the air. The powder house exploded. We flee onto the water. The glare around us everywhere, and yonder, before the darkened skies, in one great arc the jagged wall of fire. And, the day after, a silent rain of ashes, westward, as far as Windsor Park. I have long looked for a 1913 Everyman’s Library edition of Pepys, but I’m beginning to feel that Sebald made up that particular edition. 1913 is a symbolic year in Vertigo and Sebald manages to find any number of ways to reference that specific year, some of them rather suspect. In the end, I settled for a two-volume 1912 Everyman’s Library edition, which is, technically speaking, a reprint of the 1906 edition (London: J.M. 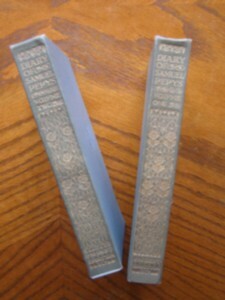 Dent and New York: E.P. Dutton). I’d like to think that this was the edition that Sebald’s narrator held in his hands as his train plowed into the year 1666. 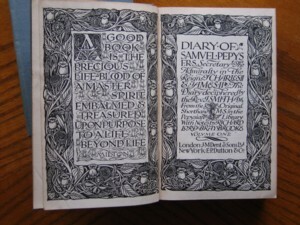 As Dovegreyreader notes, the Everyman’s Library continues to produce books that like to be read. Now published by Random House’s distinguished Alfred A. Knopf imprint, their pages of warm creamy paper are sewn and bound in tactile cloth. The one I pulled off the shelf, not surprisingly, was printed and bound in Germany. 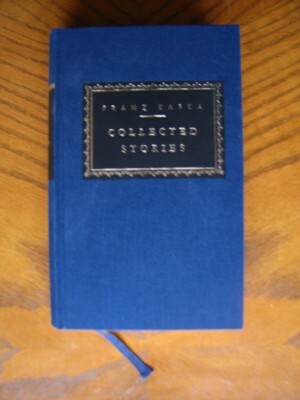 In fact, I think I’ll just move to the couch and re-read Gabriel Josipovici’s Introduction to Kafka’s Collected Stories.